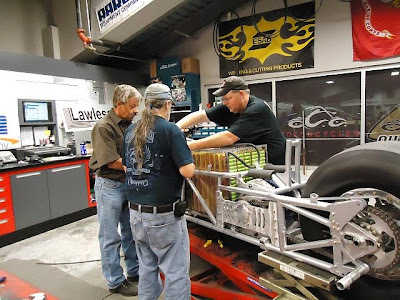 The Lawless Electric Rocket bike piloted by Larry "Spiderman" McBride made history May 4, 2012 with a record run of 6.940 at 201.37 mph making it the first electric vehicle to break 200 mph in the quarter mile! The Rocket bike was built by Lawless Industries and Orange County Choppers. The bike runs a 363 volt, 4000 amp A123 high-performance Nanophosphate lithium iron phosphate (LiFePO4) battery pack through a pair of Zilla's that control a GE 13 inch DC Motor putting out over 600 horsepower.